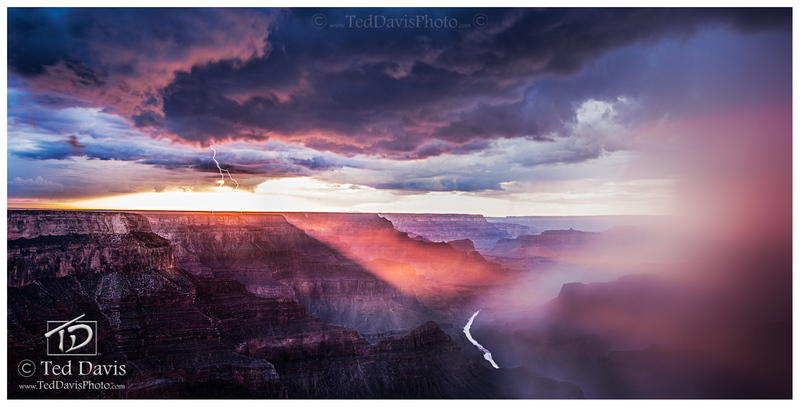 A thunderstorm on the rim of the Grand Canyon just before sunset. The wind was whipping through the Canyon, sheets of rain were cutting in and between the canyons walls above the great Colorado river. I'd been warned about lightning on the South Rim of the Canyon - extremely dangerous and unpredictable. But I just couldn't pass up this opportunity! With a rain jacket covering my camera, and a long focus on the setting sun, I snapped picture after picture hoping to get just one with a lightning strike. Finally I did - and perfectly framed by the setting sun. I couldn't have hoped for more dramatic clouds, sheets of rain moving in to the frame, or the rays of the sun cutting through the canyon. This is Mother Nature as her most powerful. Photo © copyright by Ted Davis.